OH how I love this sweet couple! They laughed, kissed and just held each other the entire time! That's my kind of session! 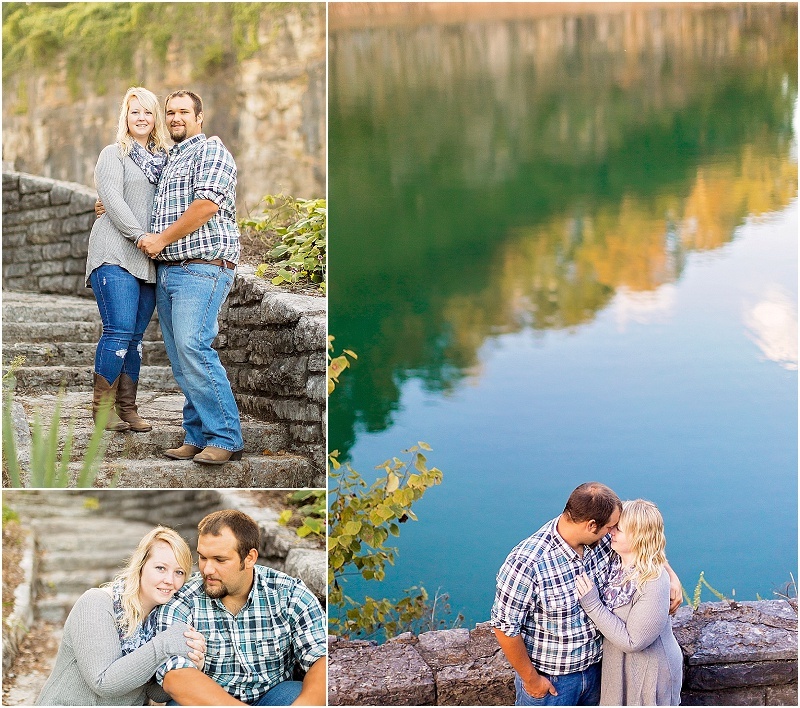 Jessica and Adam, I cannot wait to shoot your wedding at Big Ridge State Park in June! I know it's going to be just as fun and full of love! I absolutely love doing engagement sessions! Every time I do one, I say it's my favorite - then when I do a wedding or newborn session, THAT'S my favorite... so I think it's safe to say I just love what I do! ...And I love meeting sweet couples like Allison & Jordan! We started out at Melton Park, for some beautiful sun-drenched photos (and working around all the swimmers and sunbathers at the lake that evening!) then almost got lost taking the back road to Covered Bridge... But it was so worth it! I love what we were able to capture! The Engagement session is a great chance to take your time and get some more relaxed photos of the two of you enjoying just being together and being engaged. It's also a great chance for us to get to know each other, for me to see how you interact, how you are in front of the camera, if you have any nervous habits, and give you a little coaching for the best photos on your wedding day. If I've never said it, (at least a hundred times) I love Engagement sessions! I love spring, and I love downtown Knoxville. So this session was a dream for me! We started out at The Knoxville Botanical Gardens, where their wedding will be this summer. Jessie at The Historic Bleak House was awesome enough to let me know that the purple Wisteria was blooming, and we could come there for a bit to incorporate some of their wedding color into the session! Then we headed Downtown to some new spots for me, which I couldn't be more excited about! This couple though! Throughout our time together, they laughed and talked and kissed the entire session. My cheeks literally hurt from smiling with them all morning! I love what we captured, and I cannot wait for your wedding this July! Need a reason to do an Engagement Session? THIS. We had an amazing evening together, just talking about wedding plans, walking around downtown Knoxville and getting to know each other... In the cold! brrr! It's been in the 70's for 2 weeks, and the day of their session, it drops down to the 40's! But we still had a great time, and this sweet couple is getting married in just 4 short months! Allison & Scott, I cannot wait to photograph your wedding at Candoro Marble in July! If it's half as perfect as you two are together, it will be an amazing day! Not to mention, it's a gorgeous & unique Wedding Venue! I cannot wait! I couldn't have asked for a cuter couple to photograph as my last Engagement session for the year! Alex and Jace were so fun to photograph - they talked and laughed literally the entire time! How can we not get great photos? ...AND it was Alex's Birthday! Alex & Jace are getting married next October at The Museum of Appalachia, and I cannot wait! But we also wanted fall engagement photos, and the area along Melton Lake Drive in Oak Ridge and on the property of Riverside Grille was perfect! Not to mention they're catering Alex & Jace's wedding next year! If ever there was a couple that absolutely are perfect together - Savannah and Gage are that! From the short time we spent doing these photos, it was obvious that they just adore one another, and have such a sweet relationship. I'm so honored to have a part in telling their story through Engagements and their wedding this May! To say this session was fun, is an understatement! 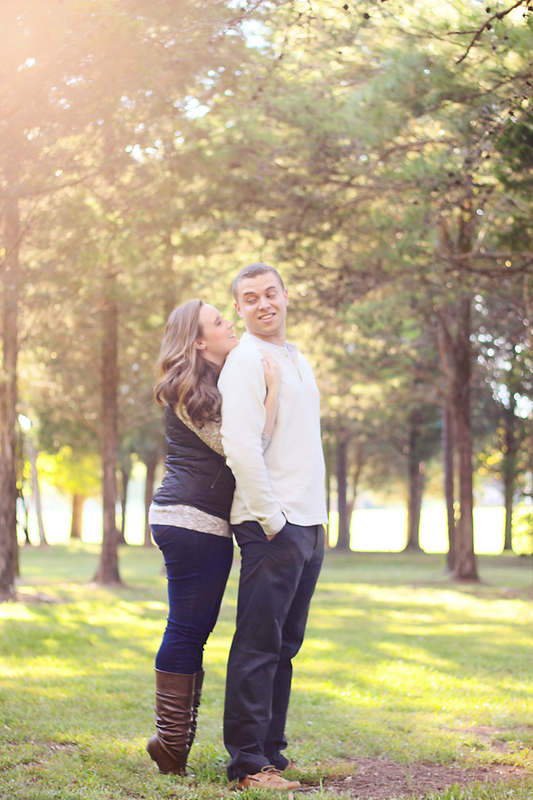 These two were so fun-loving and goofy together, it was absolutely a joy to spend the evening photographing them! I can not wait to photograph their wedding next month in Jefferson City! Laurie & Cody have to be one of the sweetest couples I've ever had the opportunity to work with! Would you just look at that love! It's so obvious they're crazy about each other! The couple is getting married next June at The Barn at Wildwood Springs, and I know the wedding day will be just as romantic and sweet. I'm a bit behind already on this new blog! But Jamie & Kody's [absolutely gorgeous] Wedding images are available for friends and family to view in their own Featured Gallery! Just click HERE. And of course, a big Thank You! to the wedding party! You guys are all so awesome! I had a great time with you all - laughing and just having a great time throughout the day! Jamie and Kody are so blessed to have such amazing friends! I just can't put into words sometimes how giddy I get over engagement sessions like this. I didn't have to tell them to hold hands, or get close to one another, or smile, or laugh or kiss. They were naturals in front of the camera, and just let their love show in every capture. Tonya and Anthony, I absolutely loved spending the afternoon with you! You have so much love for one another, and so tender and romantic - and your wedding day will be just as full of love! We've literally had this session planned for almost a full year! Alyssa's sweet sister found me, and purchased an Engagement session for the couple - and now I'm also shooting their wedding this coming June! I had so much fun with Alyssa & Thad - mainly just laughing along with them having a great time together! I know your wedding will be just as fun! Mr. Wiggles joined the fun for a few photos! But those are a surprise for Alyssa & Thad's Save-The-Dates! I hope you love these as much as I do! If you enjoyed these, please leave a comment for the happy couple!